All license, permits and tags are the responsibility of the hunter. or simply visit any business in Minnesota that handles and sells licenses through the ELS system. If you have problems applying for Zone 12 permits on-line and do not have access to a Minnesota license facility, feel free to give us a call and we wll be more than happy to assist you with your application.. Application for Zone 12 bear hunts begin some time in early April and applications need to be sent in by May 3rd, winners for the Zone 12 Lottery Bear Hunts are nortified by mail, on or before July 1st, or winners are also listed on the above link after July 1st. 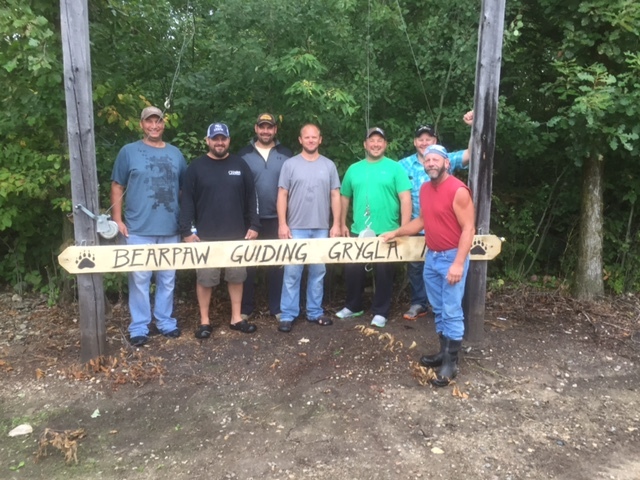 If a hunter is successful in the Zone 12 Lottery area or wants to hunt No Quota, book your hunt as soon as you can to save your place in this hunt with Bearpaw Guiding. Because not all hunters will be lucky enough to get a bear tag for Zone 12... Please give us a call... We always have "No Quota Zone" hunts that do not require an early application and can easily be purchased over the counter at any business in Minnesota that handles hunting licenses through the ELS system, by both Minnesota Residents and Non residents both. Prior to hunt, all hunter's/guides will be required to sign an Injury Waiver Release Form that will be kept on file. BearPaw Guiding will provide all paper products for the bathroom and kitchen. Paper plates cups plastic utensils etc. We will also provide an evening meal daily. Our kitchen is equipped with stove and oven, microwaves, toasters, pots,pans etc. We also have an outside gas barbeque.